Saubert tallied 48 yards on five receptions while playing in 16 games in 2018. Analysis: Although Saubert appeared in all 16 games for Atlanta, he was primarily a special-teams player. 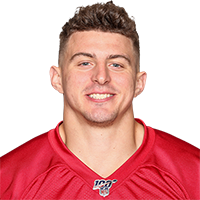 He'll figure to see a similar role in 2019, barring he improves as a pass catcher and is able to move up the team's tight-end depth chart. Saubert registered two receptions for 15 yards during Sunday's 34-20 loss to Green Bay. Saubert caught one of his two targets, compiling 17 yards during Sunday's 28-16 loss to the Browns. There are no videos available for Eric Saubert. Click here to view all videos.